Exit to the left: Red-Green. On top: Sweden Democrats. Hungry underdogs: the Blue Alliance. New elections have been announced in Sweden today. The reason is that the right-wing populist party, the Sweden Democrats, have voted on the opposition’s budget instead of the new minority government’s. The newly announced Prime Minister Stefan Löfven chose to renounce from his new post and let the people of Sweden decide their future yet again at the urns. Sweden has until today been seen as an example for Democracy. But today the Democratic example has seen its parliament collapse. 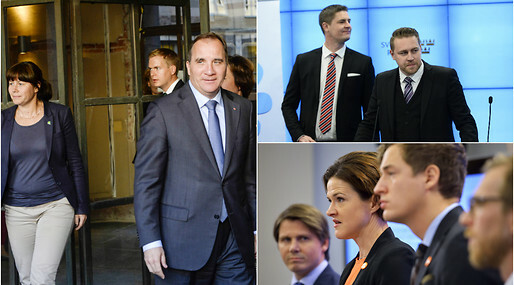 The budget proposed for 2015 by the Social Democrats, the new leading party of the country, was not approved because the Sweden Democrats refuse it. They consider it to focus more money on immigration than the extreme right wing-party desires. Elections were held in Sweden in mid-September 2014. The Social Democratic Party received the largest number of votes together with its partner the Environmental Party. The Swedish people voted for the coalition that had been promised between the Reds and the Environmental Party, leaving their tradtional partner the Left Party to simply support their politics but not be an offical partner in government. The Sweden Democrats got less than 13 percent of the votes in the election, but in spite of that they have managed to rearrange the entire political map of Sweden. Now it is up to all parties to prepare for a new round that will settle the future of the country. The Sweden Democrats have promised to vote against any budget that is opposite to their demands for lowered costs on immigration. 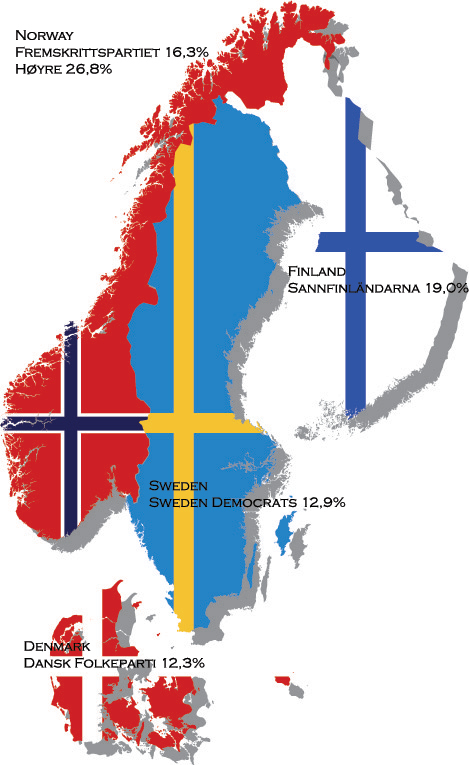 The right-wing populist parties support among voters in Scandinavia: Sweden Democrats 12,9%, Norway’s Fremskrittspartiet 16,3% and Høyre 26,8%, Finland’s Sannfinländarna 19,0% and Denmark’s Dansk Folkeparti 12,3%. In Sweden’s neighboring countries the right-wing populist parties have already gained large influence. In Sweden, their confirmation of power comes with a boom. The crouching Prime Minister complained on the Sweden Democrats lack of morals at knowing their plans a day before the voting: “This is a breach against the code of conduct at budget negotiations”. But the Sweden Democrats do not care about anybody else’s morals. They have their objectives and will not back. The Rightist Alliance, right-wing and liberal parties, led by the Moderates say they welcome the challenge to see who will win the people’s confidence after a failed democratic project. The Alliance has led Sweden the past eight years but were voted away this year. The government has been very successful in maintaining Sweden economically stable even though a crisis is affecting the rest of Europe. But they have been increasingly criticized for worsening key parts of the Swedish society such as Health and Education. A reelection has not been held in Sweden since 1958. The new elections will be held March 22nd 2015. This is a historic moment that the country is experiencing, where the new Prime Minister has to continue ruling the country on the opposition’s budget. From the new year Red will be Blue. The last eight years of Alliance rule Sweden has moved further and further away from its “Communist Sweden” days. What color the country prefers after a quarter of a year of contrariwise rule is yet to be discovered: Red, Blue or Brown. This entry was posted in Communist Sweden, Democracy, Politics, Stefan Löfven, Sweden Democrats, The Blue Alliance on 3rd December 2014 by Cecilia Vaccari.